Though Ramayana is history, it is also an eternal phenomenon happening all the time. Ra means radiance, Ma means myself. Rama means ‘the light inside me’. Rama was born to Dasharath and Kousalya. Dasharath means ‘Ten Chariots’. The ten chariots symbolize the five organs of perception (the five senses) and five organs of knowledge and action (For instance: reproduction, legs, hands and so on). Kousalya means ‘skill’. Ayodhya means ‘a society in which there is no violence’. If you skillfully observe what goes on inside the body, light dawns inside you. That is meditation. You need some skill to relax the tension. Then you start expanding. You know you are here now, yet you are not. With this realization, there is a certain lightness that comes spontaneously. Rama is when the inner light shines through. Sita the mind/intellect was robbed by the ego, Ravana. Ravana had ten heads. Ravana (ego) was one who wouldn’t listen to others. He was too much in the head. Hanuman means breath. With the help of Hanuman (the breath), Sita (the mind) was able to go back to Rama (the source). Not that there were blue babies! 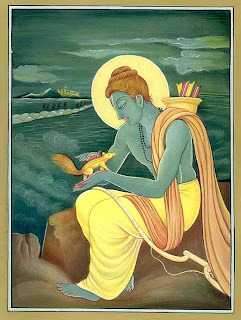 Rama is always depicted in blue colour. You know why in blue colour? It means that the body is transparent as if it was not there. He was not a blue baby, certainly! Even Krishna, Shiva are depicted in blue. That doesn’t concern the physical body but inside is infinity. Whatever is infinity is represented by blue: sky is blue, ocean is blue, the great, the big, enormous depth and that bliss, that being- the soul. The soul is never born, but still it is born when the mind and the prana and the body come together. Ramayana happened around 7,500 years ago. It had an impact on Germany and many other countries in Europe and Far East. Thousands of cities are named after Rama. Cities like Rambaugh in Germany, Rome in Italy have their roots in the word Ram. Indonesia, Bali and Japan were all influenced by Ramayana.